Although there is an invitation to look at the curled body, the identity is not revealed. The presence of humanity is denied, manipulated away from the one who is watching by the artist who had originally extended the invitation to look by placing the image on the paper, within the framework of an exhibition space and the overall context of creating art. This seduction to participate, having been denied the consummation of fully knowing and hence understanding, is much like the dichotomy of the human condition, whereby life is granted with awareness in varying strengths, but the reason for the gift is unexplained. It is the blind spot of Derrida, that understanding in the mind of the existence, but not being able to keep the knowledge and the experience in the field of immediate vision. Like a wintry day when freezing temperatures lead the inclination to burrow into the warm envelope of hearth and home, the figure wraps upon itself. As in the womb or sleeping in cosy seclusion, the figure turned in upon itself, signals privacy and introversion. Yet the display of the body is extroverted. 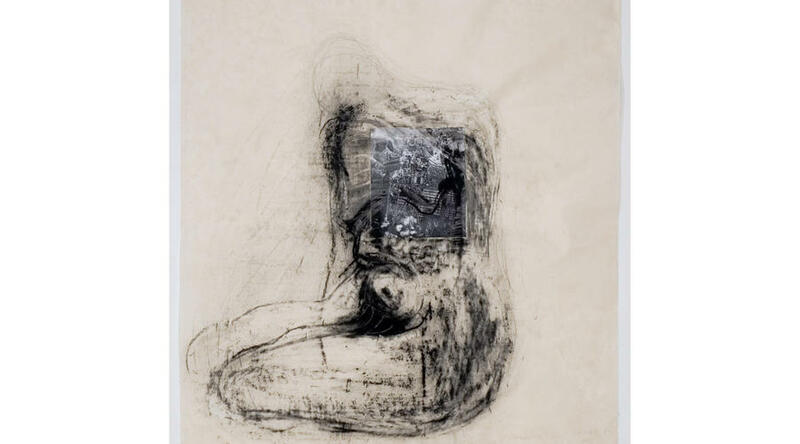 Weiss has used her corporeality as the basis for her mark making, drawing around her crouched position, tracing the outline of her body. She is realising her shape as she draws, but she cannot see it until she moves and looks back upon the paper. It is this distance from her habitation of the flesh that creates the necessary objectivity towards her being. It is a philosophical perspective, a logical rationality placed upon the immediacy of being present. 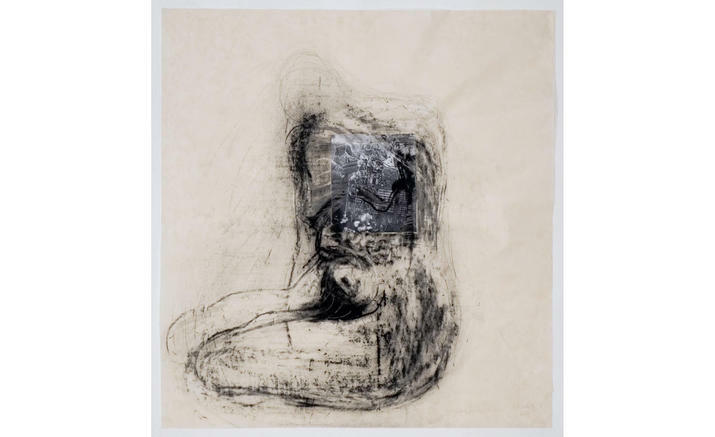 As if she has managed to step away from her shadow or to rise above her frame in an out-of body- experience, the artist has been able to 'be' in two places at once - both within her body and viewing it. 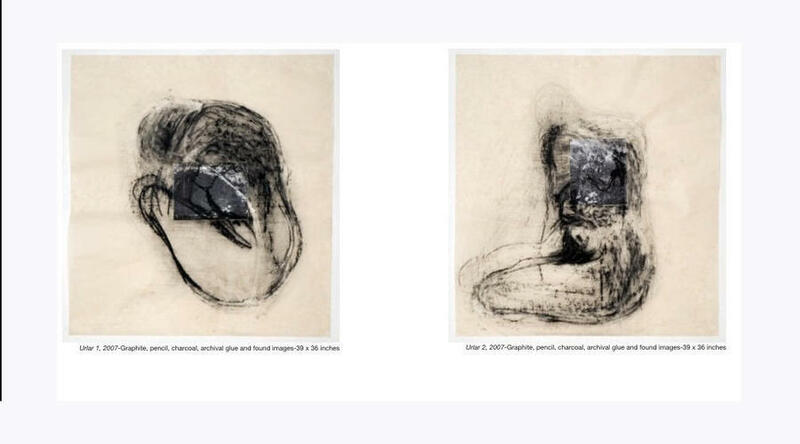 By inserting the performative, a more modern practice, into the traditional borders of drawing, the representation of the self encompasses the time dimensions - the present, the future life of the piece and the past as she steps away from the active practice where body and mark making have coupled. Rigorously intellectual, the work of Monika Weiss recreates the illusion of omnipotent dimensional manipulations of both time and space as it moves from point to line to the illusion of a third dimensional reality. Women who use their own bodies as the image within their art expose themselves in a public way while leaving themselves as they inhabit their body. They become open to critical attention and comment. Weiss is not a blatant exhibitionist. She strikes a balance between presence and absence, revelation and concealment, body and mind (as the element exposed), art practice and bodily practice. With one foot in the traditional - she is an accomplished and expressive drawer - she also straddles the river of ideas and stretches the limits of the discipline by drawing with her entire body.